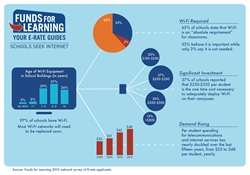 Source: Funds For Learning 2015 national survey of E-rate applicants. Since there is a potential of $5.8 billion in E-rate funding for 2016, it’s more important than ever to recognize the realities of digital learning and make use of funds to increase connectivity. In recognition of Digital Learning Day, an effort by the Alliance for Excellent Education to engage students and empower educators through effective use of digital tools, Funds For Learning shares key data about the importance of student connectivity initiatives for schools everywhere. 97 percent of schools report using Wi-Fi and the majority of those systems need to be replaced soon. It costs roughly $250-$350 per student to adequately deploy Wi-Fi on most school campuses. In 2000, school districts nationwide spent $25.35 per student each year for Internet access and telecommunications. In 2015, that number has doubled, reaching $48.62 per student. Digital Learning Day provides a venue for education leaders to highlight teaching practice and showcase innovative teachers, leaders and instructional technology programs that are improving student outcomes. To view more E-rate funding request data related to digital learning, visit https://fundsforlearning.app.box.com/s/qg5vca157u1s6mw4kz31s1fnuz1esuk9.